My other goal is to teach the community that people with visual impairments are just anyone else. They just use additional tools to access the world. This access should be universal and a normal part of day-to-day life. I am a Michigan-based Teacher for the Visually Impaired (TVI) and a Certified Orientation and Mobility Specialist (COMS). My undergraduate degree is in teaching elementary and special education with a focus on visual impairments. In addition, I have a masters degree in Specific Learning Disabilities and Orientation and Mobility for Children. For 14 years I’ve taught students aged 3-26 years old. My passion is teaching students to help them gain confidence and independence so they are successful adults. I work with students on accessing and using the technology and tools they need to live independently after they age-out of the system. Oftentimes, students with visual impairments are led to believe they can’t be successful, independent adults. So the most important part of my job is building trust with them. This enables them to believe me when I tell them that they can do anything. I had an elementary student who lacked confidence and hesitated while crossing streets. His parents were fearful and did not want him crossing a street on his own either. He was a fourth grader and at this time was not independently doing what his peers were. Together we went out weekly rain, snow or shine to work, navigate the neighborhoods, and cross intersections. So he was able to walk to friends houses to play and hang out. I never pushed him if he ever felt uncomfortable to cross. We would cross the street when he built up his confidence. He achieved all his goals that year and crossed at stop signs and even small, lighted intersections. Once he began, he advanced so quickly after he gained confidence and is now unstoppable. Building trust with parents is crucial also. So after he mastered some of these skills, I invited his parents to a lesson. His parent’s witnessed how confidently their son now crosses intersections, independently and safely. Seeing him progress was so rewarding! Recently, a former student contacted me to tell me she was accepted to a dual masters program. This student and I worked together ten years earlier. I was beyond excited to hear that she is starting a master degree! She has been living independently since starting her undergraduate degree. Now she is moving across the state by herself to start and complete her master’s program. This student also made a huge transition in her life and is transgender. I was so grateful to hear from her and learn that she trusted me enough to share with me, her transition. The trust and confidence that she has built is amazing! My other goal is to teach the community that people with visual impairments are just anyone else. They just use additional tools to access the world. This access should be universal and a normal part of day-to-day life. 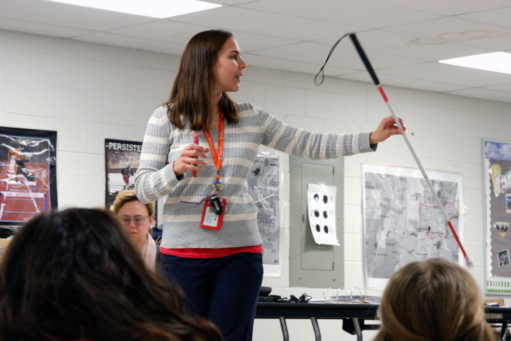 Part of my job is to teach awareness in local schools about the tools people use who are visually impaired. I also spread this awareness to the public about what helpful accommodations they can use. Along with how to help (or not help) people in the community. Recently, I was teaching an accessibility workshop to third graders. One of the students stopped me before I walked into the classroom. She said she knew someone who was blind and felt sorry for them. My immediate response was there is no reason to feel sorry for someone who is visually impaired or blind. They are people just like you or me they just access the environment differently. I told her how I knew many successful people doing amazing things. They read by using braille and travel the community and even the world, independently with a cane. The cane helps them to “see” where they are going. I began the presentation and thanked the students for coming to hear about how everyone can be independent and successful. Everyone just approaches it differently. This is one of the most important parts of my job, educating the public on how and when to help. To not pity visually impaired or blind people, but to appreciate how they navigate the world with the tools at their disposal. When the average person realizes how independent the VI community members are, it gives them a whole new level of respect. Respect is most important, not pity. A woman talking while holding up a white cane looking off camera. There are backs of participant’s heads watching the woman present about white cane safety. Pedestrian Walk Sign: Woman (O&M instructor) is holding a folded white cane, smiling looking off camera, standing at a detectable warning next to a pedestrian walk sign. Bus Stop Shelter: Woman (O&M instructor) smiling at camera holding a folded white cane standing next to a bus stop shelter. Boarding Bus: The back of a woman (O&M instructor) walking onto a city bus. Close up of Michele Danilowicz with long brown hair in her 30s smiling at the camera. Two women presenting on cortical visual impairments. The power point presentation behind them says: “Tips for Providing Interventions cont.” One presenter is looking at the camera and smiling. The other presenter is looking at the audience holding up a red Elmo stuffed animal and a red and yellow stuffed monster. They are both standing behind a table full of red and yellow materials and toys. Table with materials scattered across, a light up magnifier, dome magnifier, Braille writer, telescope, two vision simulation goggles, Braille book, large print book, large Braille cell drawn on paper with the numbers 1, 2, 3, 4, 5, 6 next to the dots and worksheets to learn Braille for print readers.